Whether he is jumping up from behind a rock to scare you, or playing April Fool's Day pranks, Boogy the Goblin sometimes doesn't know when to quit acting mischievous. Like the time he put maple syrup im Marky the Wizard's hat while he was napping under a big oak tree. When Marky woke up and put on his hat, sticky syrup oozed down his hair and face, his neck, and all over his clothes! Boogy doubled over with laughter as the red-faced Marky ran to jump into the waterfall, shrieking all the while and being chased by buzzing bees and a great big honey bear! Boogy wasn't laughing that night, however, when he started to get into bed. As he pulled back the covers, a giant bucket of water splashed down on him from on top of the bedpost, where it had been placed. As he stood there, with water dripping all over his light brown hair, nightgown and bed soaking wet, Boogy saw that it really wasn't funny having tricks played on you. The next day, wearing his best green shawl over his brown leather doublet, he humbly apologized to Marky and begged his forgiveness. Marky couldn't stay mad at Boogy for long when he saw the sheepish look in his face. He forgave him, but not without lecturing him sternly first. Boogy stood quietly, his head bent low, bottom lip trembling, and large golden brown eyes peeking up at Marky. Finally Marky sighed and told Boogy to run along. Marky stood looking after him, shaking his head. 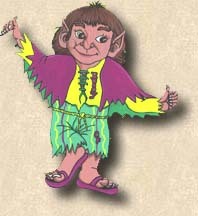 he knew it wouldn't be long before Boogy the Goblin was up to mischief once more!